Characterization of the molecular mechanisms involved in the development and progression of melanoma could be helpful in identifying the pathogenetic profiles underlying both biological and clinical behaviors of the disease. 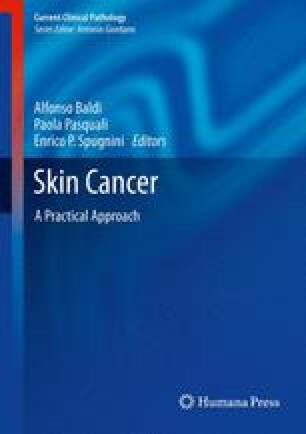 Increasing evidence indicates the existence of a complex molecular machinery that provides checks and balances in normal melanocytes, whose alterations are implicated in generating different subsets of melanoma patients with different prognoses and/or clinical outcomes. Knowledge of the main molecular features underlying the pathogenesis of melanoma is thus crucial for the development of new diagnostic and prognostic tools. Key molecular alteration which may help diagnosis, staging, and/or prognosis of cancer patients. Treatment based on drugs specific for mutated/altered oncogenic protein playing a key role in molecular pathways involved in tumorigenesis. Induction of malignant transformation due to a complex combination of genetic and molecular alterations.